A few months ago, Carol received an appreciation gift at work that was a gift certificate for dinner for four at the Barefoot Gourmet in East Thetford, VT. The Barefoot Gourmet is a private chef and caterer focusing on a wide variety of cuisines including his native South African cuisine. We thought it sounded quit intriguing, and went to his house in East Thetford VT with one of my coworkers and her partner for a dinner. This started off on a very good note, with him serving up a platter of crabcakes in the kitchen. 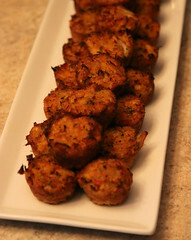 Done up as mini crabcakes about 1.5″ in diameter, these were very nicely executed crabcakes: the primary ingredient was, well, nicely flaked crab meat, with a nice herby stuffing binder (as I’ve mentioned before, I really appreciate it when I’m served crabcakes, instead of mushy “breading with a bit of crab” cakes). In short, these were very nicely done. Appetizers then continued with some hand-rolled South African style Samoosas (one of the most interesting things I learned during the evening was the interesting history of Indian food in South Africa), which were rather pleasant little crispy fried packets of spiced potato filling with a nice, flaky phyllo dough crust. 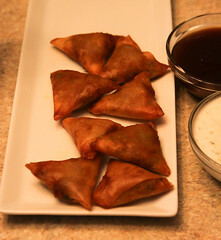 Served up with a tangy mango chutney dipping sauce, these were quite pleasant as well. After a nice little discussion of the art of cooking papadums (including a discussion of how they can be used to diagnose microwave problems) with a demonstration of same, we then retired to the dining room for the rest of the meal. 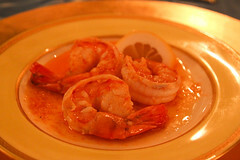 The main meal started with a serving of Peri Peri Shrimp. One of the more classic dishes of African cuisine, Peri Peri Shrimp is basically shrimp served in a very peppery sauce (the sauce is named for the type of pepper used: a “peri peri” pepper, which is similar to a Thai birdseye pepper). This dish was perfectly executed: the shrimp was perfectly cleaned and cooked, and the peri peri sauce was a perfect blend of olive oil, sharp pepper, a little bit of garlic, and just a bit of acidic tang. This was about as good as shrimp dish as I’ve had in recent history. And thoughtfully, our host had supplied us with extra bread for sopping up the rest of the peri-peri sauce after we had finished the shrimp. 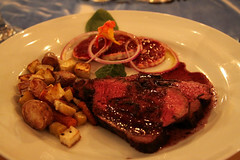 The main entree was Righetti Ranch Mop Tenderloin, a tenderloin heavily marinated with an herbal tissane, based upon a recipe the Barefoot Gourmet had learned many years ago working on a ranch in Santa Maria, CA. This was a very enjoyable tenderloin dish, with a really nice seared herbal crust, and the combination of onions, spring veggies, and blood oranges combined nicely with it. The crust was a bit saltier than I generally enjoy, but this was an otherwise perfectly roasted tenderloin. The meal completed with a fairly simple dessert: “Dinny’s Favorite” Icebox Cake. A fairly simple icebox cake, this was a rather pleasant way to end the meal. The chocolate cream was smooth and chocolately, but not too sweet. Overall, we we very pleased with the Barefoot Gourmet, as it was a very nicely done custom meal, served up by an entertaining host in his own home. We’d certainly think about trying him again in the future, or using his services as a caterer.